Winter Juried Group Exhibition, Elisa Jensen, Juror, Blue Mountain Gallery, 535 West 25th Street, New York, NY, Jan 2–26, 2019. 11th National Juried Exhibition, Lori Bookstein, Juror, Prince Street Gallery, 535 West 25th Street, New York, NY, Jan 2–26, 2019. ARTmatters4: COLOR, COLOR, COLOR with Susan Finsen and Walter Smalling at Deer Isle Artists Association, Deer Isle, ME, Jan 6, 2019. "View Points", Curated Exhibition at Blue Hill Public Library, Blue Hill, Maine. August. "X Marks the Spot: Women of the New York Studio School", Curated Group Exhibition. New York Studio School of Drawing Painting & Sculpture, 8 West 8th Street, New York, NY, July 23–August 26. "The Shape of Waters", Group Exhibit, Deer Island Artists Association, Deer Isle, ME. July 2018. "Clothes Encounters", with Susan Finsen at Tilia, Summer–Fall 2014, Brooklin, ME. "ANTIPASTI", Group Exhibit July 11–23, 2014, Deer Isle Artists Association, Deer Isle, ME. "Marchen", Exhibit with Kay Fuller and Alexandra Sherman, Evolve Urban Arts Project@Pierce School Lofts, Washington DC, Spring, 2014. Solo Exhibit, Baked & Wired, Georgetown, DC, Mar 28–Apr 15, 2014. New Torpedo Factory Artists' Association Artists at the Target Gallery, Alexandria, VA, Mar 29–Apr 13, 2014. "Size Doesn't Matter", Sixth Annual, glave kocen gallery, Richmond, VA, January. "12x12", Juried Capitol Hill Arts League Exhibit, Washington DC, January-February. Conspicuously Color, Cataumet Arts Center, Cataumet Village, Bourne, MA, Sept 15–Oct 6. Julie Heller Gallery and Julie Heller East, Provincetown, MA, 2010–ongoing representation. Exhibit with Sandy Deacon, Aug 23–Sept 5. "Land and Sea" with Sheep Jones, High Street Gallery, Belfast, ME, Aug 9–23. 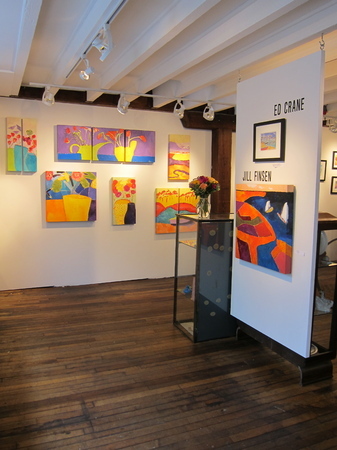 "Color Chorus", Group Exhibition, Deer Isle Artists Associaton, Deer Isle, ME, Aug 2011. Gary Fisher Gallery @ 1406 14th Street NW, Washington DC, Group Exhibit, Mar-May 2010.